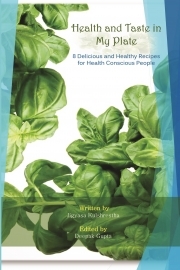 Description of "Health and Taste in My Plate"
I have written this recipe book keeping in mind health conscious people. All the recipes in this book can be made with very little or without oil. All the recipes take very less cooking and preparation time. Therefore, it is beneficial for working people also who have very less time for preparing breakfast/meals. All the recipes are high in nutrition value. The book has total 8 recipes including salads, soups, smoothie, and a special one named oats chilla. I believe that you will enjoy making and eating these quick, easy-to-cook, and healthy recipes. Jigyasa Kulshrestha is a writer by profession into the technical domain. She loves traveling and exploring local cuisines. Cooking is her passion, and she loves cooking whenever she gets free time. Her cooking mantra is "Food Made with Love Tastes Better." This is her first attempt to write a cookbook where she is sharing simple, healthy recipes. Anybody, who knows basic cooking can prepare these recipes. Let's explore cooking her way with loads of love and fun together. Reviews of "Health and Taste in My Plate"